[ Sarah Gertrude Millin, South African author. ] Autograph Letter Signed to 'Mrs. Magraw' [ children's author B. I. Magraw ], regarding her biography of Cecil Rhodes, the film version, and the recipient's 'play' of it. On letterhead of 34 Pallinghurst Road, Westcliff, Johannesburg. 22 March 1940. [ The Duchess of Marlborough, the Earl of Godolphin, and Lord Sundon. ] Autograph Signatures ('S: Marlbrough | Godolphin | Sundon') on part of an Exchequer receipt. On an irregular piece of paper, 18cm. high and 23cm. wide at the extremities. In fair condition, on aged and worn paper. Torn from a larger leaf, with one side carrying manuscript additions completing printed text ('In Repayment of Loan on the Eighteenth, 2s. Aid, Anno 1739.'). In manuscript: 'The most Noble Sarah Dutchess Dowager of Marlborough, the Right Honble Francis Earl of Godolphin, the Right Honble William Lord Sundon Executors of the late most Noble John Duke of Marlborough'. The signatures are on the reverse, with more manuscript text. [ George Combe, phrenologist. ] Autograph corrected text from his appendix to his edition of Elisha P. Hurlbut's 'Essays on Human Rights and their Political Guaranties'. On 8 x 22 cm piece of paper. In fair condition, aged and creased, and laid down on piece of card. 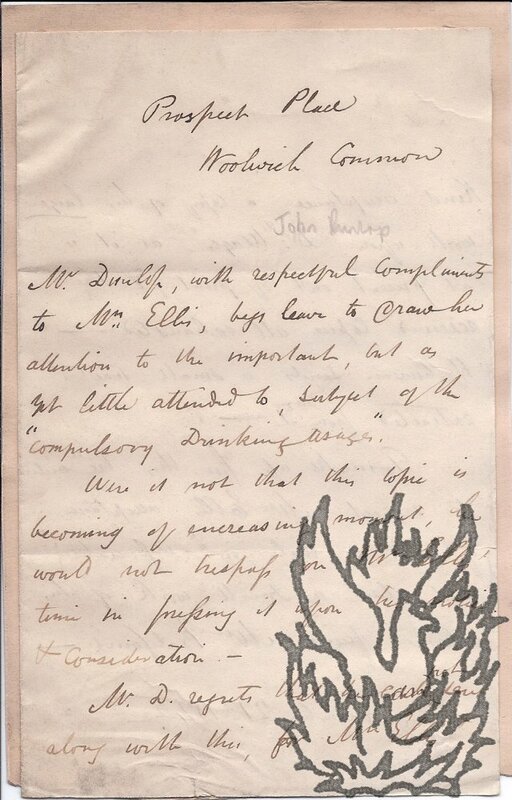 Note in a contemporary hand in red ink in the margin: 'George Combe the Phrenologist | (Holograph) [sic]'. With five emendations and deletions. [ Lady Sarah Caroline Sitwell of Rempstone Hall, bluestocking. ] 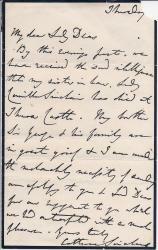 Three Autograph Letters Signed (all 'S C Sitwell'), poignantly describing her circumstances in the last months of her life. The three items totalling 11pp., 12mo. On three bifoliums. In good condition, lightly aged. ONE: 23 February 1860. 3pp., 12mo. She begins: 'I cannot receive yr. repeated welcome remembrance of old Remp[ston]e. days, without a line of thanks for the pleasurable thoughts they awaken - a boon, to a Recluse, who lives much on the past & on the far-off present, which a friendly telescope may bring before her'. She congratulates him in graceful terms on his 'success'. Autograph Letter Signed from Sarah Jones to her landlord Mr Norwood of Ashford, complaining that she is imprisoned for debt in Dover Castle at the behest of 'Mr Knocker'. Dover Castle [Kent]. 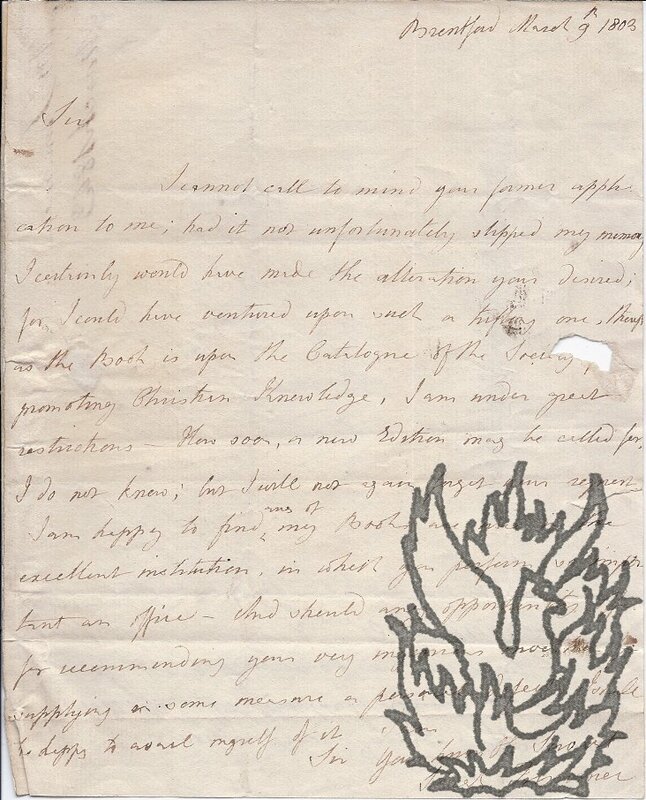 17 November 1824. 1p., 4to. Bifolium, with reverse of second leaf with Dover postmark, and addressed by Jones to 'Mr Norwood | to the left at the | Queen's head | Ashford Kent'. Good, on lightly-aged paper. The letter reads: 'Dover Castle Nov - 17 - 824 | Mr. Norwood | Sir | I beg to inform you I was arrested yesterday & sent to this place - My son in law & myself would have been up to have settled the rent, but now it must remain till I get out - I hope you will not let any one have, or touch the house. Mr.
Autograph Letter Signed ('Louisa Parr') from the Victorian novelist Mrs Louisa Sarah Ann Parr (pseudonym 'Mrs. Olinthus Lobb'), regarding the translation into French by the neice of the unnamed female recipient of her novel 'Dorothy Fox'. 18 Upper Phillimore Place, Kensington. 27 July 1872. 4pp., 12mo. Bifolium, with leaf dimensions 18 x 11cm. 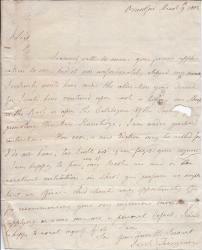 The letter appears complete, in good condition on lightly-aged paper, but a rectangle of about 5.5 x 11cm. (perhaps carrying the recipient's name) has been torn from the bottom of the second leaf. Autograph Letter, in the third person from 'Mr. 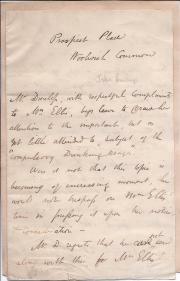 Dunlop' [the Scottish temperance campaigner John Dunlop] to 'Mrs. Ellis' [Sarah Stickney Ellis], regarding 'Compulsory Drinking Usages'. 21 November 1842; Prospect Place, Woolwich Common. 12mo, 2 pp. 23 lines. Text clear and complete. On first leaf of a bifolium, with the second leaf laid down on rectangle of paper cut from album. Fair, on lightly-aged paper. Drawing her attentiont to 'the important, but as yet little attended to, subject of the compulsory drinking usages', a 'topic [...] of increasing moment'. His 'largest work' on the subject is 'at present out of print, & the reserved copies all exhausted', so he is sending 'a small tract extracted from it', together with 'another Vol. 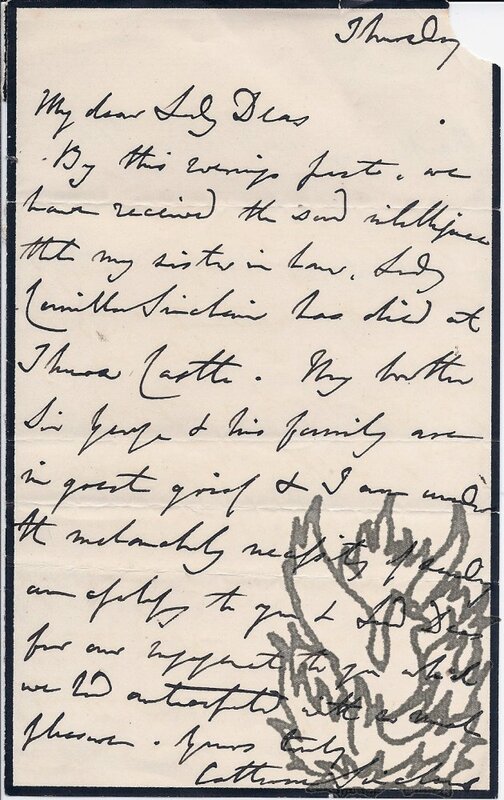 Autograph Letter Signed from the Scottish novelist Catherine Sinclair to Lady Deas, wife of the judge Sir George Deas. 'Thursday' [April 1863]; place not stated. 12mo, 1 p. Mourning border. Twelve lines. Text clear and complete. Fair, on aged paper, with small scrap torn away from top right-hand corner. By that evening's post, they have received 'the sad intelligence that my sister in law, Lady Camilla Sinclair has died at Thurso Castle'. Her brother Sir George Sinclair and his family 'are in great grief', and she is 'under the melancholy necessity of sending an apology' for cancelling 'our engagement to you which we had anticipated with so much pleasure'. All volumes printed in Newcastle-upon-Tyne. Volumes I and II: 1832. Printed by Sarah Hodgson, Union-Street. Volume III, parts I and II: 1840. T. and J. Hodgson, Union Street. Volume IV, part II: 1842. Printed by G. Bouchier Richardson. A total of six parts: Vols I and II complete in leather bindings; the rest (vol. III, pts I & II, and vol. IV, pt II, only) in original grey wraps with white paper printed labels. From the collection of the Rev. Joseph S. Cook, and with his bookplate by Bewick's studio (featuring his coat of arms, an illustration of Newton Hall, and a facsimile of his signature) in the first two volumes, and his ownership inscription to the two parts of vol. III. (Cook contributes a paper to the first volume.) Internally all parts are sound and tight, on lightly-aged paper. 4to, 1 p. 14 lines. Text clear, apart from damage to two words caused by the breaking open of the wafer. Fair, on lightly-aged paper, with traces of previous mount adhering to the reverse. Her recipient has corrected 'a personal defect' in one of Trimmer's books, calling for a 'trifling' alteration. She will make the alteration when a new edition is called for. 'I am happy to find any of my Books are now in the excellent institution in which you perform so important an office'. Autograph Signature, in form of monogram, on part of letter. On a piece of grey paper, 5 x 9.5 cm, cut away from a letter. Good. Thin strip of white mount adhering to right-hand edge. The signature is in the form of a monogram, with Prideaux's initials S and T combined to make a stylized shape with long diagonal stroke, which cuts through the final 'P.' The letter's valediction reads '<...> all my divans. | Yrs. | [signature]'. Lengthwise to the right of the signature, the slip is docketed 'Miss Sarah Prideaux | celebrated as a Lady Bookbinder whose Work has taken prizes at all the great exhibitions'. Composure in Death. A Discourse, delivered in the Orphan Asylum, New-York, On the Death of Mrs. Sarah Hoffman, First Directress of the Institution, who departed this life, July 30, 1821, aged 79 years. 8vo: 47 pp. Disbound. A tight copy, with the text clear and complete, on aged paper with light waterstaining throughout. The title continues: 'To which are added, a sketch of her benevolent exertions in favour of the widow and the orphan. - Comprising the history of the Widows' Society, and the Orphan Asylum; together with the last scenes of her pious life.' WorldCat reveals eighteen copies in American libraries, but scarce in Europe: no copy on COPAC (microfiche at University of Scotland). Papers on Literature and Art. Two volumes. London: Wiley & Putnam, 6, Waterloo Place. 1846. 8vo: [viii] + 164 pp; [iv] + 183 pp. Bound together in contemporary half calf binding, gilt, marbled boards and endpapers. A tight copy, printed on aged, spotted paper, with occasional light damp-spotting, in worn binding. Bookplate of Aemiliani Reich, on spotted, aged paper, by Gordon Browne, on front pastedown. The first volume has a four-page preface by 'S.M.F. ', dated 'New York, July, 1846.' Both volumes contain eight essays. Document signed by these four parties, part printed, part manuscript. Earl Marchmont, Thomas [ Secker ] Archbishop of Canterbury, Beversham Filmer, J. Stephens. One page, 4to, one small tear, staining, pinholes, text clear and complete. The four parties acknowledge receipt of £62.10 in their office aas "executors of Sarah late Duchess of Marlborough assignee of John Rudghe as per margin. In the margin, in manuscript is a list of years 1828-1838 with a list of yearly sums which add up to the £62.50 they are acknowledging. The list has the name John Rudge next to it. 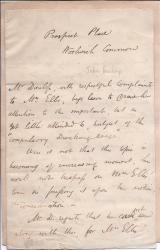 They received the money from James Earl Waldegrave (written in ms.